» Create -ve rail from +ve supplies. A product I am working on requires a -12V supply for a couple of OP-AMPS. I'm currently using a circuit based around the LM2575-12 - but I think it's a bit of overkill, as it can supply 1000 mA of current and uses a big 330uH inductor which is 12mm x 12mm. Whereas I only need about 100 mA on the -12V rail. (I could use a physically smaller inductor, since I only need 100 mA). There is a +24V supply, from which I also derive +5 V DC and +12 V DC rails. How would you generate the -12V rail? 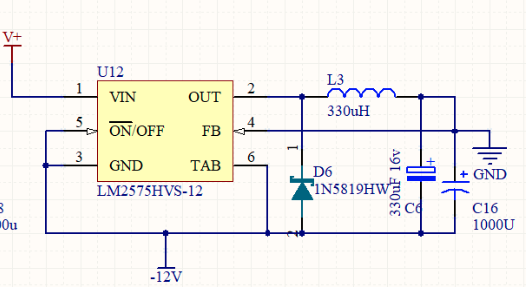 Is there a simpler / smaller circuit than one based around the LM2575? In the good old days when people used "real serial" there was usually a MAX232 lurking somewhere and the -12V it produced for the RS232 signalling could be "tapped" for other (low current) -12V use. Don't suppose you have anything like that in this design? 100mA seems an awful lot of current for two OP-AMPs. That is 1200mW which will be fairly hot. If you seriously need 1200mW, you need a proper chip. A MAX232 is no good. The good old ZX Spectrum used an oscillator and a transformer to generate -ve rails, but they were very noisy. Probably wouldn't meet modern emissions laws anyway. - I'd end up with something the same size/cost as the over-engineered approach I've used already. how do you make the +12 V ? The +12V uses an almost identical circuit to the -12V, but with GND and Vout swapped. I did look at the LTC3260 which you mention, but it is $$$ compared to the LM2575. I guess that the trick is to make a charge pump for the negative line, not which chip to use. I get suspicious when I see this...do you need to go to precisely zero? I arrived to an engineering meeting that had been going on all day...they informed me my new board would require three whiteboards full of circuitry with analog multipliers, a divider & square root circuit endless passive parts & 3 power sources on and on... after two days of thinking I replaced the whole mess with 5 resistors, a voltage regulator & an opamp. Watch out for the device you choose to use. Many positive supplies will NOT function as a negative supply because it means opposite current flow (into the + terminal instead of out). Example: 7805 will NOT work as a negative regulator. There are charge pumps that are good for maybe 50mA or so in inverting mode (+ in, - out). Charge pumps tend to be a bit noisy, though some switchers can certainly be worse. No, I'm using a +/- 12V supply so I can swing from -10 to +10 on the output. I don't need to be able to sink any current, or be absolutely precise on the output voltage, there's no special significance when the output is ==0V. The input to this is an analog joystick, I have the whole thing working extremely well, I was just wondering if my power supply was over-engineered. Maybe I'll just leave it they way it is, since it works well. 1. There are numerous ways to derive a -ve voltage rail. 3. Some are nice little "hacks" one can use such as the MAX232 idea. 4. If it ain't broke don't fix it. 5. It's good to talk things through. Charge pumps can also divide voltage by 2, so I imagine there is some clever way of using them to get +12 and -12V from +24V. However, I don't know how to do it and I imagine it will not be simpler or cheaper than the current circuit. SpiderKenny - You say a "product you are working on" but don't say if you are making one or one million of them. If you are making one - and cost of parts is less important than cost of engineering time - just use an isolated DC-DC converter. Those little black bricks that take one DC voltage in and give another DC voltage out. Expensive part at probably $5 but will save heaps of time. If you are making one million then try find a cheaper solution with switched capacitors or switchmode PSU. Well my goto chip is usually ICL7660A for this application, but my OP-AMPs don't take 100mA, more like 100uA in fact. If you can get down to 10mA or so, ICL7660A will probably do you. I'm curently using LM2664 because I need a bit more current but that won't do -12V. However I just looked around the linked parametric search; and found LT1054 (http://www.ti.com/product/LT1054) which I remember using years ago for driving RS232 long lines. Indeed, this LT1054 charge pump seems capable to output 100mA @10V with a 12V supply, according to the datasheet. Good find. I really like the Murata CRE1 series. The output is isolated from the input and isn't too horribly noisy. For 12 volt output they have the CRE1S2412SC which will take your 24 v main supply and let you derive the -12 from it. Single quantity cost is $4.25 US from Mouser. The output's only rated at 83 ma though, so if you really need 100 then this might not be a solution after all.